Colors look a bit off, but he’s finished! I finally finished the second bug. Okay, I say finally, but it didn’t even take a week this time. 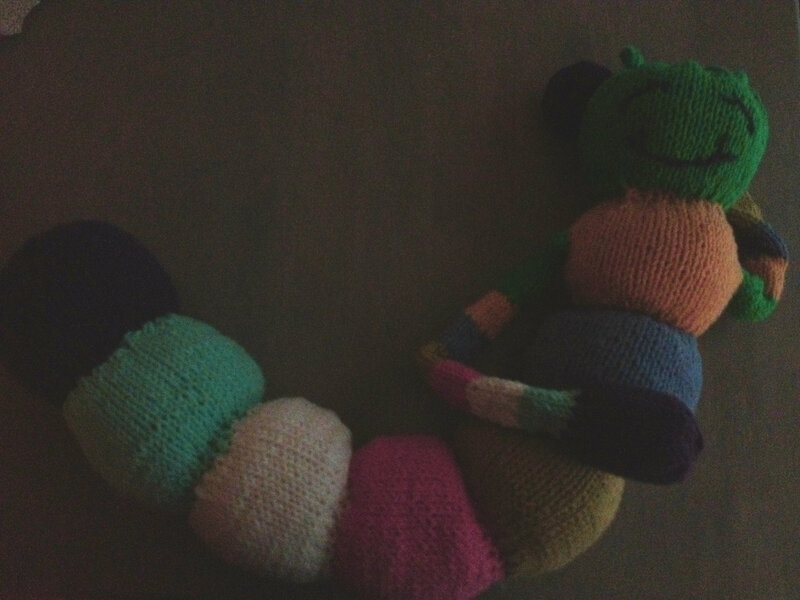 I guess once I had the rhythm and the pattern down, it really didn’t take much effort to do another caterpillar. I didn’t even have to watch my hands half the time. Like the first one, this Chadwick is made out of Sugar n’ Cream in the solid colours. I changed up the colouring on this one. Part of me wants to say it was on purpose so he didn’t look too much like the first. In honesty, I just kind of reached into my Sugar ‘n Cream stash and went with whatever I grabbed first. Now that he’s finished, I have to find the perfect time for him to “appear” in her office. I don’t want to do it too soon. Maybe Friday on Employee Awards Day. That’s when the first Chadwick is being adopted, so to speak. Next? I’m still on the toy kick. I really want to make the Android by Crayons and Milk. I spotted the pattern a couple of days ago and just fell in love. See, I have an iPhone and family members (excluding my husband) have Androids. They get the cutest mascot and I am stuck with fruit. Hardly fair. This way, though, I’ll get to have my very own adorable Android. I may use the Sugar ‘n Cream as I still have so much of it, but I was also thinking of using up some acrylic. I know, I know. Yuck, acrylic. I don’t like it that much either, but I’ve got to use up this stash, and I just happen to have the perfect green for the project. I’ve also been looking at knit hot air balloons. I’ll see if I can find the link and maybe share it later on. I think they’re so pretty and would look great in our living room or to keep on hand for any future little one’s room. I’ve seen these knit hot air balloon and cloud mobiles that I’m absolutely in love with. They look so dreamy. Now, if you’ll excuse me. I have to go swim to work. It’s raining, and unfortunately, we only own one umbrella, which is in my husband’s car now on the other side of town. I do enjoy a walk through the rain, though, and we can sure use it, especially after last year.